The first time I came to Bucharest 18 years ago, the metro system was my best friend. I knew that going by metro, I could never get lost, I had a map of the Bucharest subway and marked down the stations closed to the places I frequently went to. It is true that being Romanian made it easier for me to understand where I was, how things work, and ask in case I was unsure of things. 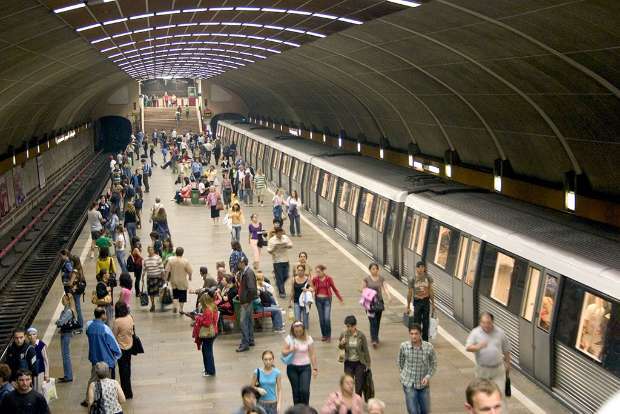 The Bucharest metro in general works smoothly and it is not a problem for foreigners to get around. 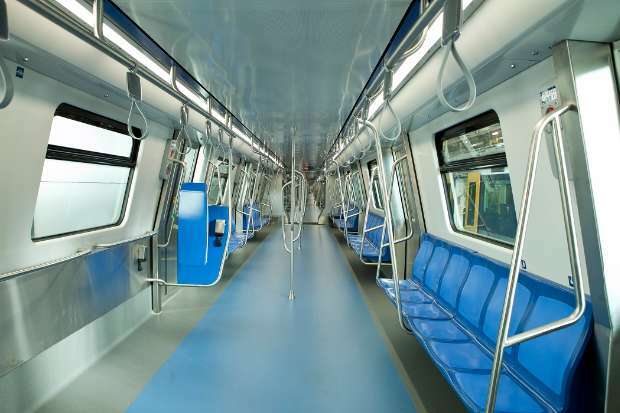 However, there are a few things you should be aware of to make sure your journey underground Bucharest goes smoothly. Either ask for a map at the sales booths before passing the metro gates, or download and print one including all four Bucharest metro lines. The official metro map is here, including the lines they are working on. Mark down the metro stations close to the places you go most often, and those close to downtown, where you could meet people. Get a Romanian friend to pronounce the names of metro stations for you and try to learn how they are pronounced. Even if you don't speak a lot of Romanian, you can always ask for directions just by saying the word metro (which is very similar to the Romanian metrou) and the name of the station you're interested in. Alternatively, show the map with the place you're trying to reach. Below are the names of all metro stations in Bucharest. When reading out the map, don't assume too much, and better ask for extra safety. I, for example, assumed the new hub at Gara de Nord works as any Bucharest metro node, meaning you can cross from one line to the other without validating your ticket again. And I was wrong. You had to enter another separate metro station, reachable via underground, but locked with a validation system (and then at a close look at the map, I could see the hub symbol was a little different, the two dots were not connected, like for all other hubs). Here is a list of metro station names, the only one I could find online (hopefully Wikipedia keeps it all updated). 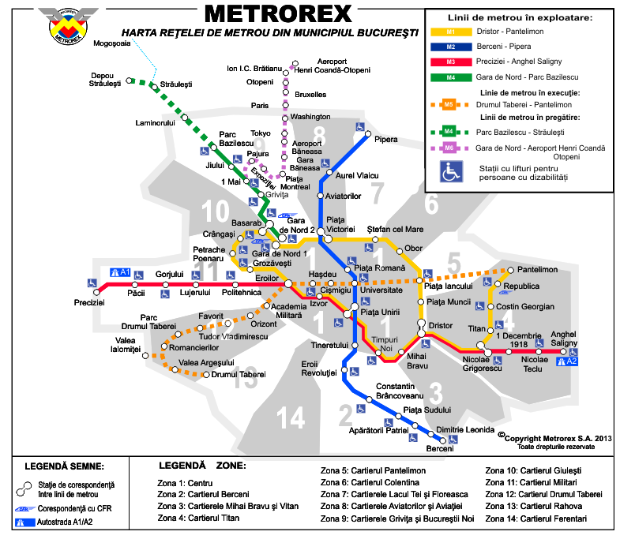 Metrorex is the name of the company which runs the Bucharest metro network. Below is its logo. You can recognize metro exits by the big logo – the blue letter M.
In order to travel by metro in Bucharest, you have to have either a card with trips, or a subscription, and validate your card upon each entry to the system. Unlike many other metro systems in Western European countries, even if you will see some zones marked on the map, the fares are not dependent on how many zones you will travel through. The fare is fixed, and one trip is valid for as long as you want, provided you stay underground. There are different types of metro cards you could use, depending on the place you buy them, how long you plan to use the subway system, and on whether you want to use public transport above the ground as well. The two easiest options are to buy the metro cards from the points of sale downstairs at the metro stations (you would have to ask for the ticket form the sales lady in most of them, but some stations also have ticket machines with an option in English), or get a bus + metro subscription for a month, which allows you to travel by metro as often as you like. Here are the types of passes available and their prices. 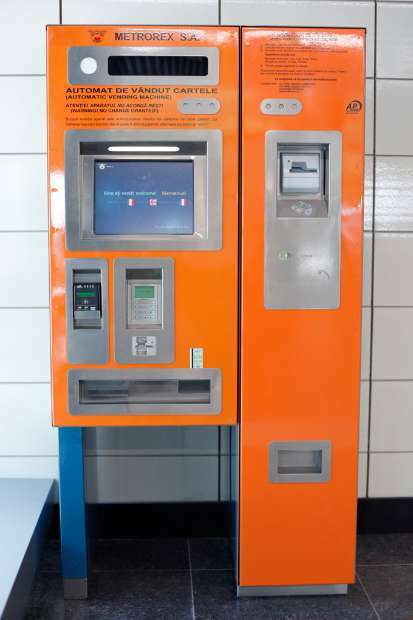 The main difference when validating the two types of passes described above - cardboard and plastic card – is that you will have to insert the cardboard one into the validation machine, and wait for it to return it to you, allowing entry to the station. The plastic one needs to be placed close to another special validation machine until it beeps. You will recognize the special validation machine as it has a different color than the rest, and is usually places at the end of the row. The metro trains in Bucharest are usually on time, and each station has an electronic board where you can see how many minutes remaining until the next train arrives. On most lines, during the week, trains arrive every 3-4 to 9 minutes, sometimes up to 12 minutes even (usually late in the evening, and on weekends, trains arrive more rarely). But sometimes accidents happen and you will have to wait a bit until the train is cleared to go, or it is too crowded and you won't be able to fit into the first train that arrives (especially at peak times, mornings and afternoons). Always add at least an extra 10-15 minutes when calculating the time it takes you to get to the metro, take the metro train ride, and walk /ride to your destination. Calculate about 3 to 5 minutes for each metro station when computing your metro route. Then take into account the time needed to reach a different track inside a metro hub, like Victoriei, Unirii or Dristor, for example. At rush hours, walking from one station to the other inside the hub can be a painfully slow experience and you will have to kamikaze your way through the row of people coming from the opposite direction to be able to outpace people and avoid being late. I personally prefer to arrive earlier in case everything goes smoothly, rather than blame it on the metro if I am late, like a lot of Romanians tend to do. Sometimes it can get very crowded in metro trains. Keep all your bags close to you, and money and wallet in secured places. I have never been robbed on the metro as I always keep my hands on wallet and phone and secure my bag, but it has happened to other people I know. The Bucharest metro runs from 5 in the morning, until 11 at night. This means the stations open at 5, and that the last metro train leaves the depot – the end of the line at 11. So in many cases it is possible to catch the last train after 11, but make a backup plan in case you just missed that last train (usually the backup plan is the taxi). 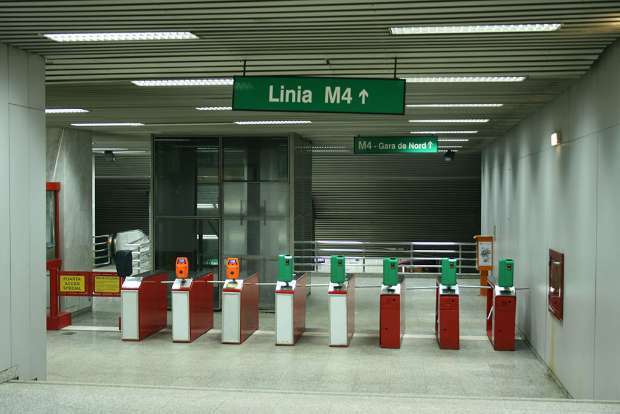 In metro hub stations Piaţa Unirii 1 and Piaţa Unirii 2, the last trains await for passengers who arrive with the respective last trains from the other lines. Here is the schedule of trains on the existing four Bucharest metro lines. Mornings – about 8 to 10 – and afternoons – approx. 4 to 6 – are peak times, when everyone's going to work, or coming from work. The metro hubs at Piata Victoriei, Unirii, and Dristor are very crowded, so better know where you want to go, cos otherwise the crowd will drag you around. At these hours, all metro trains are usually crowded, on all lines, but especially those which pass by big metro stations, either close to office buildings or universities. Piata Universitatii and Piata Romana metro station are also flooded with passengers at rush hours. I would avoid Piata Romana as much as possible as entry or exit point for your subway trip during peak hours as it has an incredibly narrow platform, and getting in an out the metro can be an annoying experience if a lot of people are queuing in front of you. It may be confusing with all the Piata Unirii 1 and 2, and Victoriei 1 and 2, I know. In all honesty, I never knew which is which, but even if I don't know which number is which, I know what metro entrance takes me to what line, or what exits to take to reach the area above the ground where I want to end up. The same goes for Piata Victoriei. This is something not a lot of people do, as everyone is busy and rushing in or out of the metro. 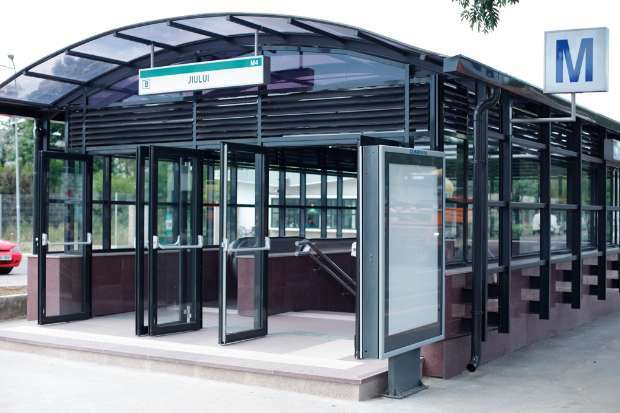 But metro stations in Romania are in fact beautiful – well, perhaps not in the sense of conventional beauty. They are for sure unique, and diverse. 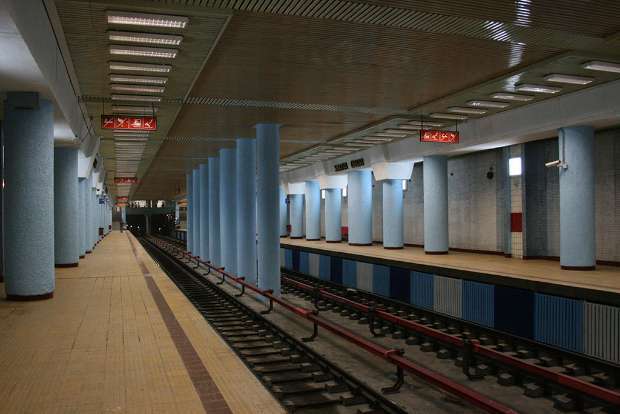 The pillars, the tiling, the platforms, these differ from one station to the other and discovering Bucharest’s metro stations is in fact discovering history, as 95 percent of these stations were done during the Communist period. You will see the difference with what's being built now (take for example the Basarab station, which is also a node, you can tell it's new, in a sort of mass production way, and the same goes for Jiului). 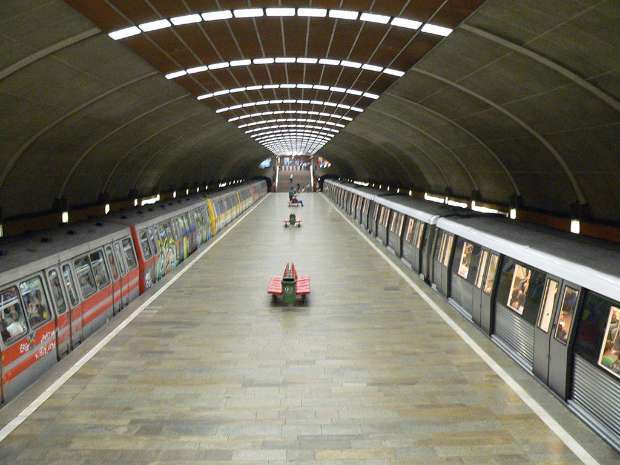 To read the history of the Bucharest metro system, go here, it also includes information about what metro stations were built first. Both for practical reasons, and for admiring the diversity we've covered at the point above, set aside a day to discover the whole Bucharest metro system. Better if it was on a weekend day. Buy a day ticket and go from one end to the other of all four metro lines. This will take a while – there are 51 stations. You can choose to see them from inside the train, without going down and then back up in the next train – this will save some time. If you chose the latter option, probably safe to set aside two days for this.